He was in the Silicon Valley before it was called by that name. He is a pioneer who opened up the whole new field of fibre optics that effected change in ways that had seemed inconceivable earlier. He prospered, founded four companies and made millions of dollars much before other Indian hi-tech entrepreneurs. The man who “bent light”, Narinder Singh Kapani, has been at the centre of the hi-tech world for over 50 years now and is still going strong at 70. 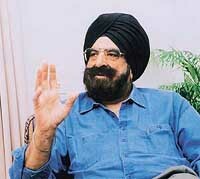 Roopinder Singh met the ‘father of fibre optics’, who was in Chandigarh recently. AT AN AGE when people are thinking of retirement, you are still getting new ideas and patenting them. How do you manage to do that? (laughs) What else would I do? The excitement of where this thing is going is what keeps me going. I keep coming up with ideas and ideas are like babies, you can’t throw them away! You got your last patent a couple of months ago. I had filed for two patents a few months ago and there are four more to come. You know, I have stopped counting. Probably 150 plus. After hundred, you stop counting. Are these patents all in fibre optics? Lasers and instruments and devices of various kinds. The basic issue is that light was supposed to travel in a straight lines till you started thinking of ways of bending it. I was a high-school student in Dehra Dun and we had this young teacher who was rather interesting. This guy once said in a very authoritative way, ‘Light only travels in straight lines.’ I was sitting there as a little child and said to myself, “Come on, that’s not true.” After I graduated, I started training in the Ordnance Factory in Dehra Dun where I laid a number of prisms and experimented with them. This was cheating. The actual use of fibres to transmit light energy started when I was a graduate student at Imperial College, London, on a Royal Society scholarship. You wrote that famous article in Nature in ’54. Yes, that, and the cover article in Scientific American in 1960 and so on. Are you excited about the direction things are moving in? If you introduce a field, which is what I did 50 years ago, and then be in it as it develops, you have to be excited about it. First came the fibre optics applications in diagnostic medicine. From diagnostic medicine, we moved to surgical lasers and then came the Vietnam war where they needed night-vision devises that used fibre optics. It was not until the late sixties that we realised that it was possible to make very high purity glass which could transmit light over many kilometres. That immediately opened the optical communication market. First local area networks, then long-distance communication and now voice, data and images are being transmitted through fibre optics. Though now we talk in terms of bandwidth of 10 gigabits or more, I believe that the bandwidth problem will no longer be an issue. We will see huge bandwidth and it will be nearly for free. The thing that I find very exciting is that the more we are doing, the more opportunities there are for innovation. There is a lot more ahead, whether it is computer-to-computer, within a computer, a metropolitan network or long-distance communication. You know, they call me “father of fibre optics,” “the unsung hero” (Forbes magazine), and all kind of things, but if dozens of investigators in the field had not contributed to it, this would have just remained an idea. Therefore, I don’t deserve 100 per cent credit! I didn’t coin the word fibre optics till 1955 because prior to that, I just thought that we would use fibres in diagnostic instrumentation. In 1955, I realised that it could be used in many other things and so I coined the term fibre optics. It has been a long journey from India to England to the USA, from a student to an academic to an entrepreneur. The physical journey has been interesting and I had straddled academia and industry most of my life, except for the past 10 years because the tempo has picked up a lot in the field. You established Optics Technology in 1960 and you launched your fourth company a few months ago. I have recently launched K2 Optronics. There are a lot of different ways of looking at K2 Optronics. It is Kapani2, of course it is year 2000 and K2 is the second-highest peak. People said to me, why did you pick up the second-highest peak? I say, well, you know, at my age, it’s nice to be a little modest (laughs). What’s this company going to focus on? Almost entirely on fibre optic communication devices, particularly switches—the area that has a major problem and a huge potential. When you have a large number of signals coming through a number of fibres and you want to switch any one of these to a particular outside fibre without converting light into electricity, that is a difficult problem, and I have a couple of interesting ideas for making it happen. The other area that we are working in is having a tuneable laser so that you can tune the wavelength. These are both Holy Grails, each of these open a huge market, but who knows what the next idea will be. When did you setup the Sikh Foundation? The Sikh Foundation was set up in December, 1967. We ran a magazine Sikh Sansar for five years. We have published a number of books and we are setting up chairs in universities. We have set up one at the University of California for Sikh studies and we were involved in The Arts of the Sikh Kingdoms Exhibition that was held in the UK, the USA and India. We are hoping to establish a museum in the USA. The focus is primarily on the richness of the heritage. You were born in Moga, but studied in Dehra Dun. I was just born in Moga, but I grew up in Dehra Dun. From there I went to London and California. It has been an interesting journey. When you see a state like Punjab, you notice that there is not much investment in technology there. Why do you think this is not happening? I think it is the “chicken and egg” problem. Regardless of where it is, Punjab or California, you need a number of factors to have hi-tech entrepreneurial ventures. You need to have entrepreneurs who have good ideas that have a good market. You need infrastructure. What Gurnihal Pirzada, Managing Director, Punjab State Electronics Development and Production Corporation, is doing is highly important. You need access to capital and talent, trained people and a financial market — a situation such that when you make your company public, there should be interest in it. That’s what needs to be developed in Punjab. It is coming. Compared to the kind of attitude you have seen in southern states, how does Punjab fare? It is definitely behind. That is why I say that time is of essence. I appreciate the lightning speed at which Pirzada’s organisation is moving. That is the kind of thing you need. Cut through the red tape. Get the show on the road. What are the other things that can put off a foreign investor? Of course, the government is the first one (laughs). The other is the lack of infrastructure, power, transportation, communication, hotels and human resources. What kind of a skill set would you be looking at if you were to come here? There are three levels. One is a technical administrator, who understands technology and has the ability to mobilise departments and people. The second set is the hands-on engineers who can handle development of products. I would also need a number of persons who can handle specific tasks. What kind of curriculum should there be for young students who want to make a career in hi-tech business? It depends on the kind of industry they want to join—chemical, bio-products, manufacturing or information technology. Whatever their area of specialisation, a background in physics, chemistry or engineering is important. Do you think that graduate students stand a chance in the open market? The foundation is there. What now needs to be done is to inspire them. Generally, university professors teach and stay in ivory towers. The days of isolation are gone. I am not suggesting that universities do not need dreamers. You always need them, but you have to be practical as well. Imagine a situation where you are asked to develop this region for new industries. What will you do? With a free rein and unlimited resources (laughs), I would not offer entrepreneurs land, because there are too many headaches involved in it. I would rather offer them built-up areas that are nearly finished. For the availability of people, I would work closely with universities and make their curriculum more hands-on. I would like the universities to shift from MBA to entrepreneurial training. I would also look at the transport problems; it takes too long to get to Delhi or anywhere else. I would make sure that we had a real international airport. Unless you connect people and places to important centres abroad, you will lose. When you are entering into joint ventures with investors, you need to provide facilities to them, so that they feel at home. Young entrepreneurs here will have to be helped in making their operational plans and finding money on a reasonable basis. Just one of these won’t do it; you have to do most of these things if not all. IT IS THE SCIENCE of transmitting data, voice, and images by the passage of light through thin, transparent fibres. It is also spelt fiber optics. In telecommunications, fibre optic technology has virtually replaced the copper wire in long-distance telephone lines and it is used to link computers within local area networks. Fibre optics is also the basis of the fibrescopes used in examining the internal parts of the body (endoscopy) or inspecting the interiors of manufactured structural products. The basic medium of fibre optics is a hair-thin fibre that is sometimes made of plastic, but more often of glass. A typical glass optical fibre has a diameter of 125 micrometres (m), or 0.125 mm (0.005 inch). This is actually the diameter of the cladding or outer reflecting layer. The core, or inner transmitting cylinder, may have a diameter as small as 10 m. Through a process called total internal reflection, light rays beamed into the fibre can propagate within the core for great distances with remarkably little attenuation or reduction in intensity. The degree of attenuation over distance varies according to the wavelength of the light and the composition of the fibre. When glass fibres of core/cladding design were introduced in the early 1950s, the presence of impurities restricted their employment to short lengths sufficient for endoscopy. In 1966, electrical engineers working in England suggested using fibres for telecommunication, and within two decades silica glass fibres were being produced with sufficient purity that infrared light signals could travel through these for 100 km (60 miles) or more without having to be boosted by repeaters. Plastic fibres, usually made of polymethylmethacrylate, polystyrene, or polycarbonate, are cheaper to produce and more flexible than glass fibres. However, their greater attenuation of light restricts their use to much shorter links within buildings or automobiles. Optical telecommunication is usually conducted with infra-red light in the wavelength ranges of 0.8-0.9 m or 1.3-1.6 m — wavelengths that are efficiently generated by light-emitting diodes or semiconductor lasers and that suffer least attenuation in glass fibres. Fibrescope inspection in endoscopy or industry is conducted in the visible wavelengths — one bundle of fibres being used to illuminate the examined area with light and another bundle serving as an elongated lens for transmitting the image to the human eye or a video camera.